By now you should have seen or heard of the Nike “Dream Crazy” campaign. It’s the one that caused some controversy for featuring Colin Kaepernick, an outspoken American Football player and campaigner for social justice. It’s been huge in the US and in the advertising industry across the world. Here’s how the search volume for the brand name has trended over the last 5 years, you can see an absolutely HUGE boost around the time of the ad launching. That’s great, right? I thought so too. But then I checked out Nike’s website – with the location set to the US. Notice how there’s no mention at all of the “dream crazy” or “sacrifice everything” slogan on their home page? I clicked around to try and find it. In the men’s section, it’s the 3rd banner down, way below the fold. On the women’s section, it doesn’t appear until the 7th banner, despite the ad featuring Serena Williams, one of the most dominant figures in sport, let alone women’s sport. And it doesn’t feature at all on the kids’ section. I guess you could say: “So what? They got a potential customer to the website and it’s a good site and iconic brand so they’ll probably buy something”. I think that misses the mark. Customers don’t make purchasing decisions quickly, it’s all about their journey. In my opinion, the journey starts brilliantly with an emotive ad, but when they then visit the site and don’t see the same message that brought them there, then the journey is interrupted. And that’s never a good thing. The more seamless the journey is, the more successful the campaign will be. But what about the world’s largest social media platform, Facebook? I was really shocked to see that they hadn’t posted anything about the campaign on Facebook at all. So I used Facebook’s info and ads feature to check out what kind of ads they’ve been running and despite there being plenty of them, not one was about the campaign. 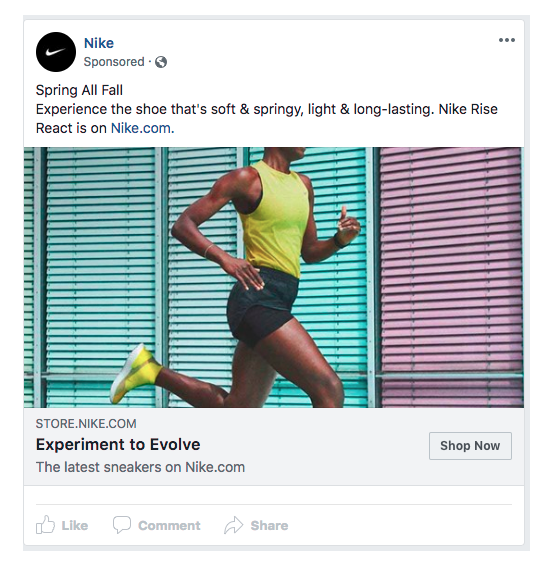 Everyone is talking about Nike at the moment, having a Facebook ad with a link to their site capitalises on this and means they’re not relying on the customer to remember to look them up. It’s great that they’re running conversion focused ads, but if those ads aligned with the offline campaign I would expect them to be a lot more successful. With all the data Nike must have, they could have created ads for each of their range of products with the campaign message running throughout. In my opinion, this is a huge missed opportunity, and one I’m surprised to see from such a big brand. There’s no reference to it at all on the English speaking countries websites like Australia, Canada or the UK. Why? The stories in the campaign are universal and relatable to people regardless of location. The celebrities they feature are global, everyone knows Serena Williams. So why not leverage that in other markets? 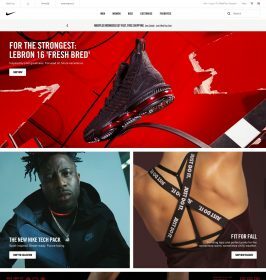 Nike is a huge brand and this campaign has had the reach that most companies can only dream of, but there are three key lessons regardless of the size of the company you work for. 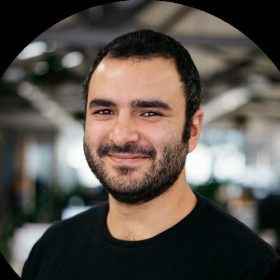 Firstly, if you’re going to run an advertising campaign, make sure that your website aligns with it in order to make the customer journey as seamless as possible. Secondly, ensure that your advertising across platforms centres around the campaign theme in order to get the most out of it. This campaign from Nike hit the mark on so many levels, and will likely go down as one of the most memorable in recent times. But by neglecting some of the digital elements, I believe it makes a simple mistake which could have made it even more successful.